Will you buy one Android One? Google is planning to launch its much-awaited $100 smartphones (Android One Phone) in India (₹6000 appx.) this month, which is going to intensify competition in the multi-billion dollar smartphone market in India which is on boom. Also Google is expected to make exciting new announcement on September 12. But expect Android One coming pre-installed with all kinds of bloatware due to the marketing deals that many manufacturers sign in a bid to offset some of the costs. 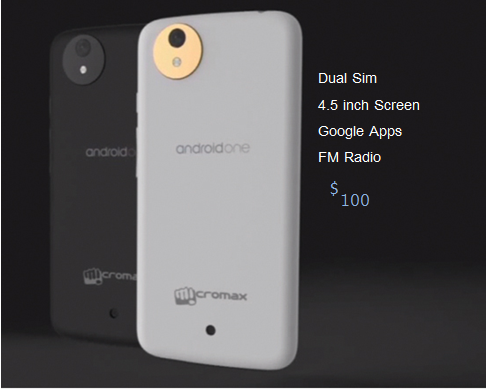 Google announced its ‘Android One Phone’ initiative in June to bring in under $100 smartphones which might add the next one billion population to the Android ecosystem.Google had partnered domestic handset makers namely Micromax, Karbonn and Spice to bring these devices (Android One Phone) into India in October this year. Android One devices will be launched around the world, starting with India. 18.42 million smartphones were shipped in India during the second quarter of 2014. Samsung is the leader with a 29% market share, while Micromax (18%), Karbonn (8%) and LAVA (6%) are close competitors. Android is the most popular and dominant operating system worldwide, other OS like Windows and iOS (Apple) are also gaining popularity. Newer platforms like Tizen & Firefox could emerge as strong challengers to Google’s platform.Now Google’s attempt with under $100 Smartphone ainms to capture a larger share of the entry-level Smartphones segment.Last week, Firefox partnerships with Spice and Intex and launched two new smartphones, which were priced below Rs 2,300, aimed at those looking to upgrade from phones to smartphones. Please subscribe us or like us on Facebook to stay updated about Android One Phone, iPhone 6, Note 4 and Nexus 6, also get latest Tech Updates right in your inbox.